Awesome run through the Jug with some great people during the AZ Canyon Rendezvous! Good flow, nice temps, and an overall great time! Canyoneering Hydrology: The study of water movement and its behavior relating to the topography, which allows us to properly assess dangerous water hazards that can exist in Canyoneering. The most common terms you will hear are swift water, whitewater or class 3 canyons. These types of canyons are located all around the world and are considerably different from dry canyons which require a separate skill set to navigate the hazards. Swift water canyons can be extremely dangerous and as with all aspects of Canyoneering, instruction, practice and training cannot be substituted for this information. Water behaves differently according to the volume, shape of the river bottom and types of obstructions which can then effect and produce different movements. 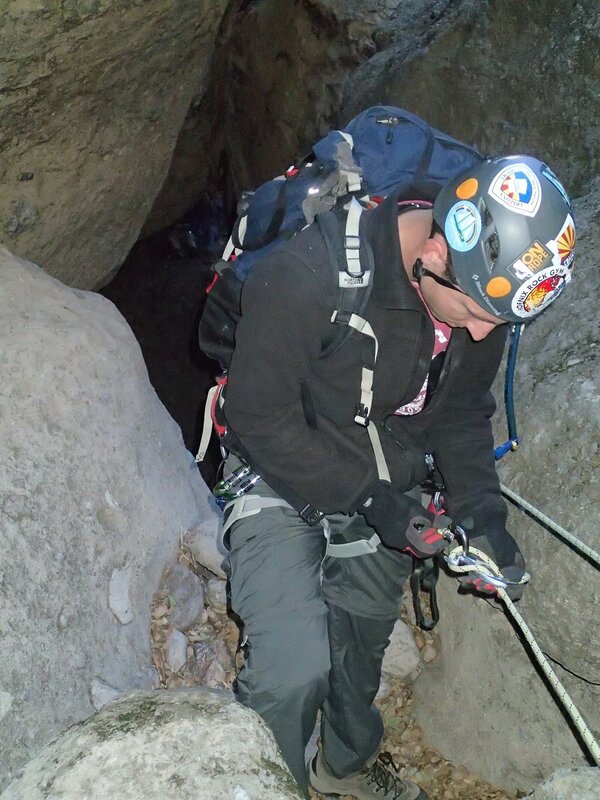 Canyoneering Hydrology needs to be learnt to reduce the risk of injury, mishap or even death. Ice Cube Canyon is located in the Red Rock area of Nevada and is a excellent trip through an outstanding canyon. A shuttle is set up as shown on the map/gps track or as always you could simply hike in from the exit as needed. Once at the upper trail/parking location, you will find a well defined trail that will quickly have you gaining most of the days elevation and shortly after have you standing at the technical drop in point. Throughout the approach you will have great views overlooking the red rock scenery and the strip off in the distance. Once geared up at the technical section, be prepared for a day of up to nearly 2 dozen rappels depending on your groups approach. Plenty of webbing are rings are recommended to refresh any drops as needed. Shortly after the first few rappels, a great section of narrows are encountered that get you warmed for the many drops to come. A few drops throughout the canyon have been know to stick ropes in the past and from our view these were fairly obvious when encountered. A quick observation, a few well place items, a well laid out rope, was rewarded with a smooth pull and made light work of any concern. Soon after this first section of narrows, the canyon opens up to a great spot to relax and enjoy lunch before pressing on. Working down canyon towards the next section of narrows is quite wide and no raps are encountered for a bit. Eventually this level ground cliffs out as the canyon once again begins to tighten up. Moving forward, the canyon and its remaining drops will have your group throwing rope consistently for the rest of the day. In addition to the 200' rope required for the larger drops, our group also brought along several 100' ropes to keep pushing and speed things up in an effort to avoid the bottle neck of people waiting to get on rope at each station. Lots of great scenery are encountered throughout the canyon and after many rappels and short swims you will soon find yourself staring down the last drop of around 190' with a view of the vehicle in the distance. Make your way down to the open rocky section below and remove gear. From here it is a short rock hop down the remaining canyon to the wash, where soon a trail leading out can be found on the left. Once on trail, it is smooth sailing back to the vehicle where you can unpack, get your second vehicle, and make your way out of the park. Seek immediate medical attention for anyone who appears to have hypothermia. Until medical help is available, follow these first-aid guidelines for hypothermia. Be gentle. When you're helping a person with hypothermia, handle him or her gently. Limit movements to only those that are necessary. Don't massage or rub the person. Excessive, vigorous or jarring movements may trigger cardiac arrest. Move the person out of the cold. Move the person to a warm, dry location if possible. If you're unable to move the person out of the cold, shield him or her from the cold and wind as much as possible. Keep him or her in a horizontal position if possible. Cover the person with blankets. Use layers of dry blankets or coats to warm the person. Cover the person's head, leaving only the face exposed. Insulate the person's body from the cold ground. If you're outside, lay the person on his or her back on a blanket or other warm surface. Monitor breathing. A person with severe hypothermia may appear unconscious, with no apparent signs of a pulse or breathing. If the person's breathing has stopped or appears dangerously low or shallow, begin CPR immediately if you're trained. Don't apply a warm compress to the arms or legs. Heat applied to the arms and legs forces cold blood back toward the heart, lungs and brain, causing the core body temperature to drop. This can be fatal. Don't apply direct heat. Don't use hot water, a heating pad or a heating lamp to warm the person. The extreme heat can damage the skin or, even worse, cause irregular heartbeats so severe that they can cause the heart to stop. Passive rewarming. For someone with mild hypothermia, it is enough to cover them with heated blankets and offer warm fluids to drink. Warm intravenous fluids. A warmed intravenous solution of salt water may be put into a vein to help warm the blood. Irrigation. A warm saltwater solution may be used to warm certain areas of the body, such as the area around the lungs (pleura) or the abdominal cavity (peritoneal cavity). The warm liquid is introduced into the affected area with catheters. In early January, two Colorado ice climbers began their third first ascent of the day in the Dark Canyon, 25 miles south of Redstone in the Raggeds Wilderness. Duane Raleigh (age 56, with 43 years of experience) was leading the first pitch of the WI3+ M4 route. Due to thin ice, the only protection he placed on the 230-foot pitch was a stubby screw at approximately 75 feet. Raleigh reached the end of the rope without finding an anchor, so he asked his partner (40 years of experience) to take him off belay, so he could continue climbing and searching for an anchor. Raleigh spotted a precarious stack of granite that he thought might be secure enough to sling for a rappel anchor. He tested the pile by hitting it with a tool and then pulling on it. Although apprehensive about the anchor’s stability, he had no better option, so he wrapped a 10-foot 6mm cord around the rocks and tied the ends together with a flat figure-8 knot, visually checking and tugging the knot to test it. He then clipped his rope to the cord with a carabiner, planning to downclimb most of the route to minimize weighting the anchor. patch of soft snow in a dihedral. He was uninjured except for two crampon punctures in his thigh. Raleigh climbed back up, expecting that the anchor rocks had failed. Instead, he found an untied 6mm cord. He retied the cord with a retraced figure-8 bend (Flemish bend) and successfully downclimbed and lowered to the good screw he’d placed at 75 feet. He pulled the rope and then lowered to the ground from the screw. general category of rappel knot. When tying the flat overhand to join two rappel ropes, always tie a well-dressed knot and leave long tails (15 to 18 inches). Individually tighten all four strands of rope entering the knot. If using ropes of different diameters, age, or condition, or icy or wet ropes, consider tying a second overhand immediately adjacent to the first as a backup, though this will increase the bulk of the knot. Or, if there are no concerns about the knot snagging when the rappel ropes are pulled, consider the double fisherman’s knot or Flemish bend, which are very reliable, albeit more difficult to untie after loading. Do not use the flat overhand to join ropes permanently (e.g., tying a cordelette or tying a rope around a tree for an anchor). The double fisherman’s knot is preferred for these purposes. Also, do not use the flat overhand for tying slings or webbing. Use a water knot for slings that may be retied and a double fisherman’s for permanent knots. Again, dress all knots carefully and tighten every strand. By reducing excessive exposure to high temperatures and taking other precautionary steps, most heat-related illnesses can be avoided. Those who work in hot or humid environments — such as manufacturing plants, bakeries, or construction sites during summer months — are most at risk. However, even long, hot afternoons at the beach can pose problems if warning signs are ignored. Heat-related illness can strike anyone. But chronic alcoholics, the elderly, the young, the obese, and individuals whose immune systems may be compromised are at greater risk, as are individuals taking certain drugs, such as antihistamines, antipsychotic medications, and cocaine. High humidity also increases the risk of heat illness because it interferes with the evaporation of sweat, your body’s way of cooling itself. Heat stroke, the most serious of the heat-related illnesses, occurs when the body suffers from long, intense exposure to heat and loses its ability to cool itself. In prolonged, extreme heat, the part of the brain that normally regulates body temperature malfunctions. This decreases the body’s ability to sweat and, therefore, cool down. Those who have certain medical conditions that decrease the body’s ability to sweat — such as scleroderma or cystic fibrosis — may be at greater risk of developing heat stroke. Measuring water flow is an important aspect for canyoners. A marked increase or decrease in flow can create a hazard or make safe passage through previously navigated rapids more difficult or impossible. Flow rate is measured in either Cubic Meters per Second (m³/s) or Cubic Feet per Second (cfs) depending on the country. By knowing the measurements of the river at a given spot, it is possible to calculate its flow volume at any point between confluences. This counterweight system allows the victim to be raised when lowering is impossible. This system is possible when the rope is not attached at the bottom. With a right foot pushing into one wall and a left foot pushing into another, stemming is one of the most natural ways to climb. You can more or less stand straight up on your legs instead of hanging on your arms. It’s most common in dihedrals and chimneys, anywhere you find a corner that’s narrow enough to bridge the gap with your lower body. Stemming can get you past completely blank sections of rock and provide a much-needed rest in a spot where there are no jugs. You might be fingerlocking in a crack in the corner, palming the walls to push your way up, or crimping tiny face holds on the outside, but the key to good stemming technique is all in the feet. It might feel less secure than standard face and crack climbing because you’re relying heavily on friction, but follow this guidance to float even the cleanest corners. No amount of mono pull-ups or finger strength will help you up a holdless corner. Stemming is all about oppositional force. Both arms and legs should be pressing outward on opposing faces to support your weight. If using face holds or a crack with your hands, maintain three points of contact, using your hands only to hold your body in place while you move your feet up. If you’re palming the wall with your hands, point fingers down or backward, away from the corner. Push hard and shift your weight between your arms to move each foot up. Focus your force into three limbs until you can unweight a hand or foot, raise it up, then repeat. Upward progress will come from your feet, since you are essentially standing on the wall. Concentrate on moving feet first, and only use your arms for balance. Depending on the shape of the corner, the traditional stemming position (pictured above, facing the corner, with both arms and legs out like an X) may not be the optimal approach. Experiment to find the best body position. Hands can jam a crack, layback a seam, grab a face hold—whatever you can do to stay solid and walk your way up the wall. Sometimes back-stepping on one side to push your hip into the wall will be ideal. In a narrower corner, you may be better off chimneying: pressing your back into one wall with your feet against the other. Between wide walls you might have to employ a bridge technique by placing both hands on one wall and both feet on the other, putting your body almost horizontal across the gap. These sections frequently lack good protection and require a strong head; success depends on maintaining confidence. Stemming relies on pushing muscles rarely engaged by climbers, specifically the triceps, glutes, calves, and small outer hip muscles. The core is also really important for performing the balance-intensive weight-shifting and high-stepping moves; you need to be able to stay tight from your hand all the way down through your opposing foot. Consider adding some weightlifting exercises that focus on these muscles: dips, pushups, planks, side planks, calf raises, overhead shoulder press. When doing these exercises, concentrate on achieving the slow burn that closely resembles the endurance required for doing these moves for a longer period. Choose a moderate weight and go for high reps or time. While singular stemming moves might not feel taxing, maintaining oppositional force for a whole pitch will sap your strength fast. Take every opportunity to shake out an arm or a leg. Unlike with face climbing, your forearms won’t limit you in a corner; the pump clock will be counting down on your calves as you smear. Keep your heels as low as possible to maximize friction and minimize calf fatigue. Many positions can be turned into a rest, allowing you to shake out one limb. Any time you find a foot chip or ledge, stand straight down on it to relax your other leg. Even just a second of this will get some much-needed blood flow into your large leg muscles. In some circumstances you may be able to lean a shoulder into the wall, or even your back, for a more secure and less exerting breather. If you find any down-pulling jugs, consider hanging completely on your arms to shake your legs out. Stemming isn’t about strong biceps, forearms, and fingers of steel; it’s about balance and hip flexibility. I’d argue that stretching or yoga are just as valuable as hangboarding. I was always fairly flexible, but practicing yoga led to huge leaps in my stemming ability. A hard stemming corner won’t have footholds, so think about where you need one to stay in balance. It’s all about pressure and friction, so ask yourself, “Where do I need to place my foot to stay in balance?” Usually it’s much higher and wider than you want. Rock always has divots or imperfections. The Teflon Corner on El Cap has a stemming sequence that looks blank. But when you feel the wall, your palms fit into undulations and little imperfections. I spot any divots from below and put chalk on them—and I chalk my palms A LOT! Resting relies on relaxation and creativity. Fighting my way up a corner seems impossible compared to when I relax and let my body do what it wants to do. Often it takes one attempt to loosen up and find that balance where you are never pushing too hard but trusting the friction. When I’m redlining in my legs, opposing palm holds allow for a millisecond to shake them out. As a corner gets wider, you need more than a blank wall: a tiny crack or crimp—something! When I freed Moonlight Buttress, I stemmed the crux pitch where most people layback. It drastically took the weight off my fingers and put it on my legs. A narrower corner has more options, like chimneying (with your back against one side). Many stemming corners can be overcome with creative chimneying. Learn the best way to tie a Wrap 2, Pull 1 anchor from the CMC Rescue School. Sometimes you don't have a long enough piece of web for a Wrap 3, Pull 2, so the compromise is just two loops around the anchor point. 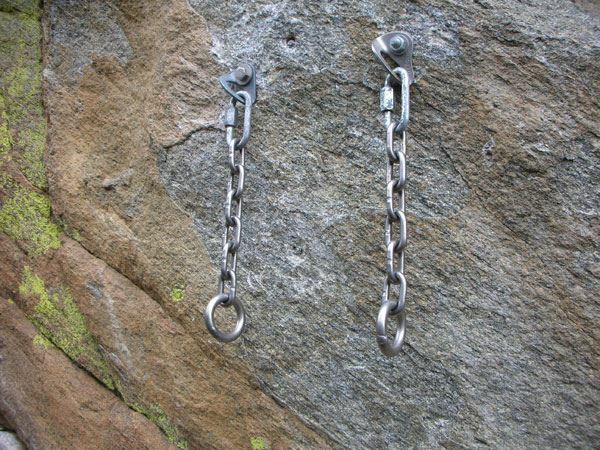 Learn the best way to tie a Basket anchor from the CMC Rescue School. Also called a U configuration, first tie the loop and then wrap it around the post and connect it with a triangular screw link. Keep in mind that while this high strength has four legs, failure of one will cause the entire anchor to fail. 1. "Head for a climbing gym," Green says. "Climbing indoors is easy and safe, and it's a great way to try the sport and see what it is about. You can rent equipment, get instruction, and learn basic climbing skills." When you get to an indoor climbing gym, watch the experienced climbers. Reach out to other climbers at the gym and learn from their experiences. 2. Learn the language: Rock shoes are shoes with smooth soles made of extremely sticky rubber. A harness is a belt that loops around a climber's legs and waist and has attachments that connect to a rope. A belay is a metal device used in belaying (one climber securing the rope for the other climber as he ascends) or in rappelling (a controlled slide down the rope to the ground). 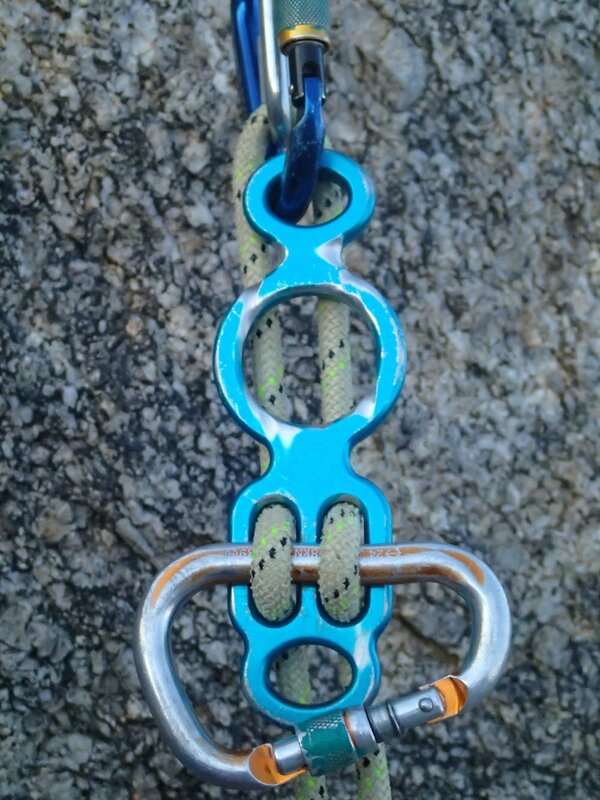 Locking carabiners are metal links that connect the climbing rope to the harness. 3. Perfect your moves and your rock-climbing skills before you head out to the real rock. Consider building your own climbing wall. That way, you can boulder, or climb to small heights, and practice your technique. 4. Once you feel ready to climb outdoors, recognize that climbing is a dangerous sport. The most advanced indoor skills don't necessarily prepare you for a safe outdoor experience. 5. To make an outdoor experience as safe as possible, go with experienced climbers. Hire a guide or take outdoor lessons from a guide service. 6. Even if you head out with a group of experienced climbers, don't rely on them for your safety. Be responsible for yourself. Learn to tie your knots, check your knots, tie them to the rope, and check your anchors. 7. Remember that climbing doesn't just involve the arms. "People often ask me, 'Am I strong enough to go climbing?'" Green says. "The answer is usually yes, because climbers use their legs and feet to push off, rather than their arms to pull themselves up." 8. Don't let a fear of heights prevent you from rock climbing. "Many people focus on their fear of heights and their fear of falling," Green says. "I tell people those are two of our basic human fears, and they keep you alive." 9. Learn to trust your belayer (the person holding the rope for you). You can't climb without trust. 10. If you fall in love with climbing, consider buying equipment. But when you start, you can rent equipment: a harness, a helmet, one or two locking carabiners, and a belay rappel device. "Those are your personal climbing tools," Green says. "You'll also need a pair of proper climbing shoes. They mold to your feet and are less sloppy and slippery than tennis shoes." Proper footwear is key. “I recommend choosing softer climbing shoes, so you’ll be able to get a better feel and grip on the wall,” Johnson says. Skip socks if they're your own shoes, and wear thin ones if you're renting. For bouldering, the only other piece of equipment you need is a chalk bag, and you’re good to go. For top-roping, climbers also need a harness, lead rope, chalk bag,carabiner, and belay device—all of which should be available to rent at your climbing gym.